This aerial picture shows how Highway 510 meanders across the unique landscape of Southern Labrador in Canada between Cartwright and Mary's Harbour. Highway 500 was the original route of the Trans Labrador Highway and measured 341 miles with the finishing touches being completed in 1992. In 1997, an extension of the highway was granted by the Newfoundland and Labrador government which became Highway 510. Construction of Phase II began in 1999 and extended between Red Bay and Cartwright for another 254 miles which was completed in 2002. Nearly halfway along this section of Highway 510, one will reach Mary's Bay, some which is still gravel surface. Phase III of Highway 510 is still under construction which will take one to Happy Valley-Goose Bay in Southern Labrador, Canada. The scenery along Highway 510 is beautiful and one will pass many small communities filled with history and culture, all of which are worthwhile exploring. Aerial of Highway 510 winding across the landscape and waterways between Cartwright and Marys Harbour in Southern Labrador. 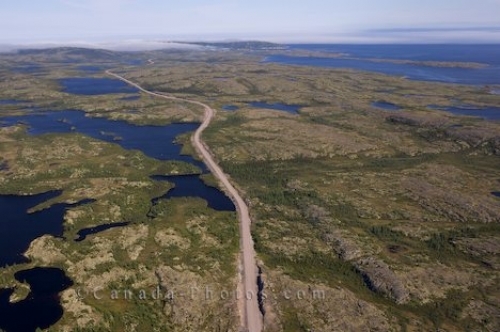 Aerial view of Highway 510 between Cartwright and Mary's Harbour in Southern Labrador, Labrador, Newfoundland Labrador, Canada.